DS title Pokémon Link — known as Pokémon Trozei in North America — was a fine example of how Nintendo has been able to diversify and expand the franchise in different directions. This download-only sequel — once again developed by Genius Sonority — continues that trend, but has more monsters to catch, locations to explore and complexities to uncover. If you've played many Match 3 puzzle titles over the past few years then you'll know roughly what to expect with Pokémon Link: Battle! (also known as Pokémon Battle Trozei in North America). 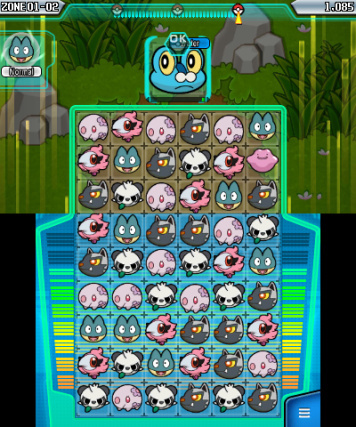 Various Pokémon are arranged in your "Link Box" on the bottom screen of the 3DS, and using your stylus you can move them around to create matched lines. A line of three will cause the Pokémon to disappear and damage will be inflicted on the wild Pokémon which appears on the upper screen, but going for longer lines results in more damage, as well as other bonuses. For example, getting a link of five Pokémon instigates a "Scatter Attack", which deals out punishment to more than one wild Pokémon on the top display. What makes Pokémon Link: Battle! slightly different from games like Puzzle & Dragons is that when you start a link you have a limited amount of time to add more Pokémon. Matching three starts the link, but if you're swift enough you can add a couple more before the process is complete. Furthermore, it's possible to create cascading links as more Pokémon fall into the Link Box to take the place of those which have been cleared. This can often result in considerable chain-reactions which increase the amount of damage you eventually administer. It doesn't end there, however. Getting a link of four or more Pokémon opens up other possibilities — match three or more immediately afterwards and you'll trigger a "Link" (or "Trozei") chance. During these moments it's possible to create links with two Pokémon instead of the usual three, which means you can build up a massive combo if you're fast enough with the stylus; keen players will find that they can entirely empty the Link Box during these attacks. 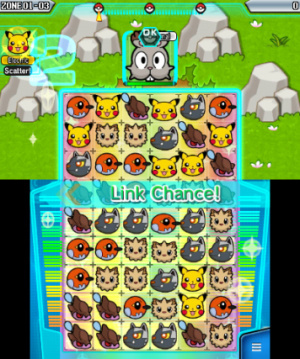 This mechanic makes Pokémon Link: Battle feel a lot more frantic than similar Match 3 titles; in other games, you only have to worry about scanning the playing area for your next move, but here you almost have to plan two or three moves in advance to ensure that the combo keeps on going. As is the case in the core Pokémon series, each monster's attributes play a role and knowing all of the various strengths and weaknesses is definitely a bonus. Pitching a type which has an advantage against the enemy Pokémon will result in more effective damage, while taking the opposite approach will reduce the impact of your attack and potentially waste a combo. It's worth keeping in mind that the element type of your attack is determined by the very first link you make, which lends the game a welcome element of strategy — there's little point in racking up a massive combo if you know that your opening move isn't going to be effective against your opponent. Needless to say, a broad knowledge of the Pokémon universe is incredibly helpful, especially when you're facing a stern opponent and need to identify a suitable Pokémon type with which to fight back. Less experienced players who don't know their Chespin from their Magikarp may find the whole experience slightly bewildering, but knowledge comes with time. Of course, during gameplay the enemy Pokémon don't simply sit there and absorb your attacks — they fight back, depleting your health and sometimes smashing through the barrier which surrounds the Link Box, thereby making it harder for you to create successful links. Thankfully it's possible to regain health by linking Chancey, and other Pokémon have special powers which can be called upon to level the playing field. You'll certainly need to use these whenever possible, as the stronger foes you face don't think twice about playing dirty — they have special powers that shuffle the order of your Link Box when you're in the middle of a combo, making it hard to build up an effective attack. To counter such nefarious tactics you can pick any Pokémon you've successfully linked with as your partner, which means that they are certain to be added to the Link Box on each stage. If you know the type of Pokémon you're likely to face then you can select a partner which is strong against that type, giving some an advantage from the start. The more you use a Pokémon as a partner, the stronger the bond becomes between the two of you and this results in even deadlier attacks. Pokémon Link: Battle's single player mode sees you moving around an island and fighting Pokémon in various locations, and it goes without saying that ensnaring all 718 Pokémon (that's every single one in the series so far, including those introduced in Pokémon X & Y) is going to take quite some time. When this challenge is eventually overcome the allure of multiplayer beckons, but sadly it's limited to local play only — being able to play against others online would have increased the longevity of the game even further. 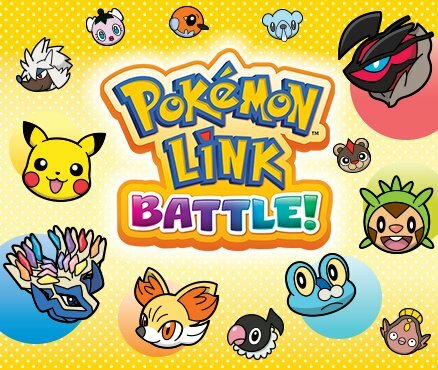 Pokémon Link: Battle's surprise announcement hasn't given fans much time to get hyped up about its arrival, but it certainly deserves to find a large audience. The Match 3 puzzle action is well done, and the emphasis on building combo attacks makes it feel significantly different from other examples of this genre. There's also the appeal of collecting all of the 718 Pokémon in the game, and while the lack of online multiplayer feels like a missed opportunity, local co-op matches with friends fill the void to an extent. Like so many puzzle titles, repetition does become an issue over prolonged periods of time, but the portable nature of the host platform makes this ideal short-burst entertainment. Will pick this up as soon as i have the money. Missed out on the first one. In the description there's no wording of 3D can you guys confirm this please..... Kinda lame but I like the 3D in my 3DS, once you go 3D you don't go back ^.^ lol granted I'd still Download it. It would be so cool if they added a feature that allows transfer from this to X/Y. Also, do you just collect the 'mon by defeating them or is there a difference between beating them and catching them? Come on, did you really have to just put a little "(aka North American name)"? Emphasizing the British names. I'm so used to it being the opposite way around on other websites. By the way, how did that Pokemon competition go? After 12 hours of the post, I only saw three comments, two made by author of the post... I would have thought that more British chaps were on the website. So just because it says Pokemon it gets a doubled score from the rest of the match 3 games. But is multiplayer download play at all? Or do you have to have your own game? That's important! Wishful thinking on my part, but does this game have Download Play like the previous game? Wow, it sounds like this has a lot more depth to it than I first though! I'm going to think about getting this. Kind of sad US still has to wait a week. @unrandomsam No, it's because this one is actually good. This is a high quality, well made game that plays well and even does a little to mix things up. At least, that's how it sounds in the review. It's not a stock art puzzle game that feels clunky and only has an infinite mode where all you do is try to beat your previous highscore. Day 1 buy now that Shovel Knight won't arrive this month! Game Freak finally learned how to make a good Pokémon spinoff. This sounds great. And I feel that filling that Pokédex will be as addictive as the one in Pokémon Pinball. @unrandomsam Guessing you've never played Pokemon Link? It's one of the best matching puzzler games out there. What makes Pokémon Link: Battle! slightly different from games like Puzzle & Dragons is that when you start a link you have a limited amount of time to add more Pokémon. 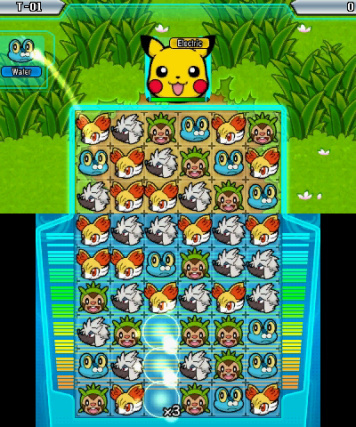 I'm pretty sure Puzzle & Dragons offers a largely similar combo system. You can stack elemental energy in combos, which increases the attack power of your monsters. So (for me, at least), the difference is rather negligible. I might get it, though the lack of plot or characters as well as the missed opportunity of online multiplayer holds me off for now. Nice, the announcement trailer caught my attention so I might get this soon. Only thing stopping me is not knowing how many blocks of memory it uses. Perhaps that information could be included it on the game's info sidebar? Does it include a mode with gameplay akin to the original game where you slide the Pokemon to make rows? I really like that Nintendo isn't just leaving it up to indie developers to fill the eShop with little treats like this; they've really come up with some surprise gems! Lead by example, Ninty. @unrandomsam You clearly don't know what you're talking about. This game is very well made as was the last one. So there is no option to use the circle pad to link Pokemon in the link box, I have to use the stylus to perform this task? @Neko_Chan Game Freak deals with the main series games; they don't make all Pokémon games. i never expected this game to have online multiplayer..
Gonna download this one on the launch day. The first Trozei was pretty good, and this one looks even better. The only thing that's bugging me is the ultra-lame European name. I wish there was an in-game option to change "link" to "trozei." Does anyone know the reason behind these name changes? The only thing I can think of is that "trozei" might sound similar to some German words, but so what? No online multiplayer is certainly not a turn off; seeing as DS/Wiis online is getting the shaft in two months. Local is where it's at. I still play the original off and on, but will eventually get this. Bonus if Nintendo decides to release this as retail later though. >_< wish this came out in America tomorrow x-x but no, it has to come out the week im back at college. I love these kind of puzzle games and the collecting aspects sounds like it adds a lot. Getting this now! @Neko_Chan Look up Pokemon Conquest. It is a strategy rpg similar to Fire Emblem's style but with pokemon. That one got high review scores. One spinoff that I love that some people love also and some hate is the mystery dungeon series. Awesome dungeon crawler from the ones I played. (Have not played the new one on 3ds yet). You would be surprised what you can dig up with a franchise. Yes like most series the spinoffs if not awful are at best meh but there is always hidden gems that are just as good as the main series. @dadajo the 3DS one pales in comparison in just about every way. All of the others are good though. Wow, this review misses the entire point of the gameplay NOT being just another Bejeweled clone. You are not forced to merely switch the position of two adjacent "tiles" that will cause a reaction. No, you can freely move tiles around. So it's no more a "match 3 game" than Puzzle League, Columns and what not. The term "match 3 game" implies that it plays just like Bejeweld, Puzzle Quest, Candy Crush and all of those games, but that is not the case here. Just to clarify that to people. But I also gotta say I'm pretty surprised that the gameplay has changed this significantly from the first game where you had to move around whole rows and columns. And you would have to connect 4 of the same, followed by 3 and then 2. @ olaf-symbiote: There is no German word sounding anything similar to Trozei. Oh, and Trozei is the terrible name here. I'm glad it's Pokémon Link in Europe. @Kaze_Memaryu That's not what I was trying to say - in this game, you can keep adding more Pokemon to the match - so if you create a line of three, you can then add another one or two to that link if you're quick enough. In Puzzle & Dragons, as soon as the match is made you can't add any more to it - in fact, the game pauses for a moment while the match is removed (something which doesn't happen in this game). @KeeperBvK Match 3 is quite a broad genre, and the fact that I didn't mention Bejeweled, Puzzle Quest or Candy Crush in the review speaks volumes...how can I be comparing it to those games if I never actually mention then? Like I said, Match 3 is a broad genre - it basically means matching three or more of a icon. @Damo Is this game addictive? I hope so! @Damo So, when you defeat a pokemon, does it join your party, giving you 700 or so "levels" (since I'd assume you get a few starting pokemon)? Downloaded it this morning and it is great! Simple gameplay that can get quite intense at points, especially if you're fighting a particularly strong opponent Pokémon. Collecting all the Pokémon isn't all that simple as in some stages you have to satisfy certain requirements (which as of yet I'm not sure what they are) to activate the appearance of certain Pokémon. And in some sections, like the Safari Zone, the Pokémon you find in there will change from day-to-day. The absence of online multiplayer really doesn't bother me personally, but I can understand why it is seen as an opportunity missed. Especially considering they included it in downloadable titles like Dr.Luigi. All in all, first impressions are really good! Very enjoyable puzzle game that I can easily see myself going back to again and again. @Prof_Clayton Yes, every Pokemon you defeat is "linked" and added to your collection. You can then use them as a partner Pokemon during the game. @Damo Because "Match-3" doesn't mean anything where as part of the mechanics there is some possibility of matching 3 of something. There is no proper games whatsoever linked from this page for example. @unrandomsam Not every Match 3 game is exactly the same, they all have different mechanics - which is why I can't understand there being an issue with me not comparing this title directly with other examples of the genre. That's like complaining that the reviewer of a 3D platforming game hasn't tirelessly listed every single way in which it's different from a handful of other examples of the genre. There was no mention of the streetpass feature in the review. 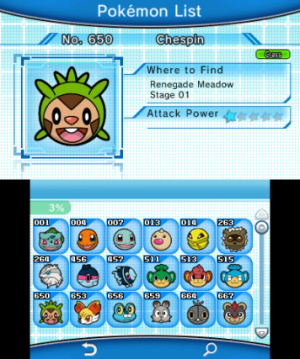 Given how other impressions I read criticized how some of the Pokemon are only encountered by bringing specific ones to specific locations and the game gives you no info on these conditions (I'm getting memories of Mew in Pokemon Pinball now...); the streetpass might help in this respect. @Olaf-symbiote This happens a lot with games Nintendo releases in Europe. Sometimes it is done to make the English title a bit simpler (if you use that title throughout Europe and some people speak English as a second or third language). Then again there are odd ones likeg Sakura Samurai > Hana Samurai (they're both flowers, right?). Speaking of which the UK pokemon.com website alternates between the two. @unrandomsam Match-3 implies you have to match things in sets of 3 or more. Sounds like this game, in a nutshell. @Prof_Clayton Also includes stuff like Dr Mario if you want to define it like that. (Or any puzzle game where 3 is the minimum). If you could transfer defeated pokemon to X and Y, I would've gotten this. As it is now, no buy for me. Good stuff, I'm not usually the biggest fan of puzzle games but this looks pretty cool. I remember seeing the adverts for the original when I was younger and being interested, but never got it. I'll probably wait for some sort of sale to come up (still have a bunch of games to play which I haven't even touched), but this is definitley on my watch list. looking forward to puzzle and dragons next ! Finally! Had to play Puzzles and Dragons on my iPad while waiting for this (but that was lots of fun!) and I can't wait to download it today. No DLC/Microtransactions+ every known pokemon catchable? Yes please. I really hope they give us a demo. It looks like fun, but the sort of game I need to try first before I know if I'll actually like it. Tried the original. This is a cheap download title, so buy for me. I have been stuck between buying this one and Retro City Rampage for a long time. Retro City Rampage looked fun, but it just didn't look like something I would enjoy for very long. This looked fun, but I just had my doubts. But now that I have read this, I'm certainly gonna get this! One thing that would make this game a must buy is if it was linked to Pokemon Bank or to Pokemon X/Y so that you could transfer Pokemon you caught in Pokemon Link: Battle to the main games. That would be awesome. @Damo Ah, yes. From that perspective, it really is different in approach. I don't even like pokemon and i'm getting this game!!! I remember playing the first one and really liking it, but I haven't touched it in ages. I'll definitely be getting this. This is an awesome game. Really addicting and I like the complexity of starting with the right number and the right Pokémon. I'm very quickly in Link Chance, which is even more fun. Trying to clear the field and then the field next to it and so on is a lot of fun and needs a lot of quick thinking ahead. It looks great, it sounds great and I love how the Pokémon are used and wild Pokémon can be unlocked after a certain goal is reached. Love it. I think I'ma grab this on Thursday when it releases. I used to play this Pokemon puzzle game on N64... Pokemon Puzzle League? Something like that. Anyways, it was HANDS DOWN one of THE funnest games I've ever played. Just SUPER addictive... Ever since then I've been sweet on Pokemon puzzle games, whatever form they come in. Looks like I'll be picking this one up! Glad to hear its a good game. Its a shame no online multiplayer, but I guess local is better than nothing. It seems like the main game is deep enough that's what you'd mostly be playing anyway, since I doubt the online mode would unlock anything. I'm guessing this is pretty much a game that is the equivalent of a full cartridge game, so the price isn't bad. Funny, when the game was announced I thought it could be good, but doubted to even consider to buy it. @AyeHaley Yes. I'm hoping Puzzle and Dragons 3DS comes over here by the end of the year. Got it, played it, LOVE IT!